When Disney acquired Marvel and Star Wars I’ve got to admit I was pretty excited about the crossover potential having those two properties in one place presented. I didn’t necessarily expect them to really do any crossovers between the two but, you know, it was still exciting. But we haven’t seen much of that. 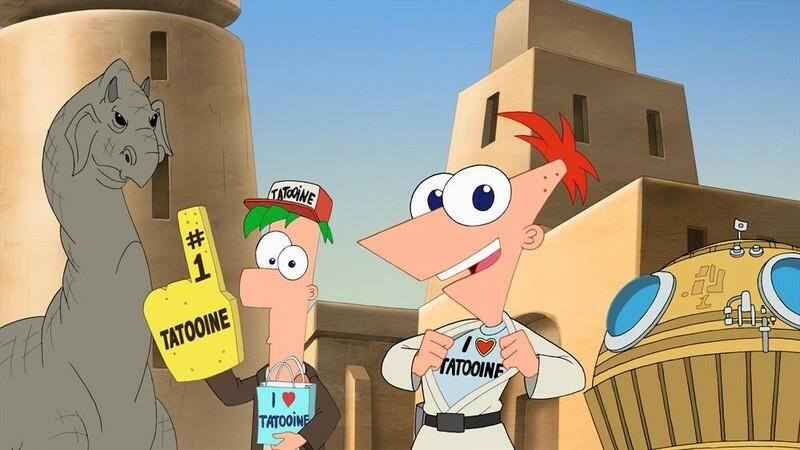 In fact, only one series has truly embraced the potential of Marvel and Star Wars entering the Disney family and that’s the Disney Channel original series Phineas and Ferb. I love Phineas and Ferb. It’s such a fun show and it sends so many positive messages about family, science, and making the most of things. The humor is quick-witted and smart. It’s no wonder that the show appeals to such a wide audience. It’s also no surprise that the creative team was able to create such fantastic crossovers with two other massively popular franchises. 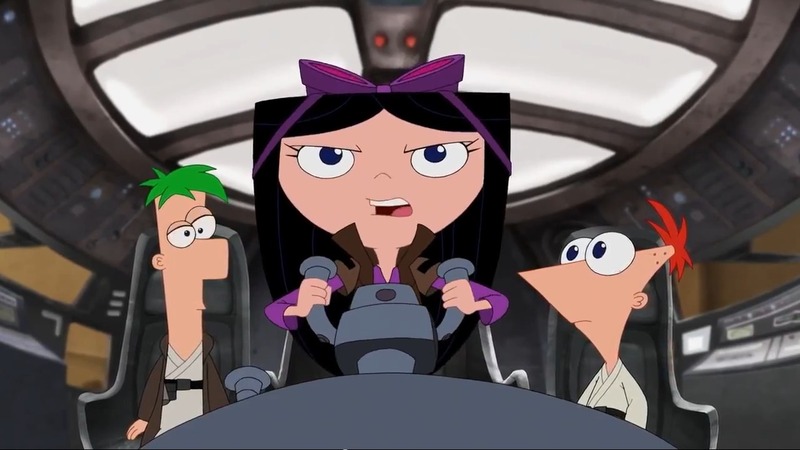 The Phineas and Ferb Star Wars special originally aired in a one-hour time slot on July 26, 2014. If you haven’t seen it yet, this is basically the perfect opportunity. You only need to be vaguely familiar with the show to enjoy the Star Wars special. For the most part, life in the Star Wars universe isn’t all that different for Phineas, Ferb, and Perry the Platypus. The boys make the most of their summer on Tatooine occasionally stopping by to visit friends like Luke Skywalker, taking Jedi training lessons with Old Ben Kenobi on Tuesdays, and to picking up power converters at Toshe Station while Perry serves as a spy for the Rebel Alliance. Their summer plans are disrupted, however, when they inadvertently come across some lost Death Star plans and decide to take it upon themselves to get them back to the Rebel Alliance. This puts them opposite of Phineas’s long lost sister Candice who is a gung-ho stormtrooper looking to take down as many Rebels as possible with Baljeet and Buford at her side. They team up with Isabella, a rival of Han Solo’s who has a bone to pick with that guy, and she helps them reach the Death Star where a number challenges await them. Meanwhile, Agent P tries to foil the evil Darthenshmirtz who admires Darth Vader and is determined to create a Force-powered weapon to destroy the Rebel Alliance. Their adventure puts them in the same places as the famous heroes from A New Hope but in their own series of crazy, kooky predicaments. You’ll often see Luke, Han, Leia, and the others in the background and occasionally you see scenes from the movie from a different perspective. For example, we hear Han’s conversation over the comms from the prison block but from the opposite end of the things. It’s fun to see the characters and the humor from the regular series bring all that craziness into the Star Wars universe. All I can say is that I hope they do crossovers with the next two films in the original trilogy, too. 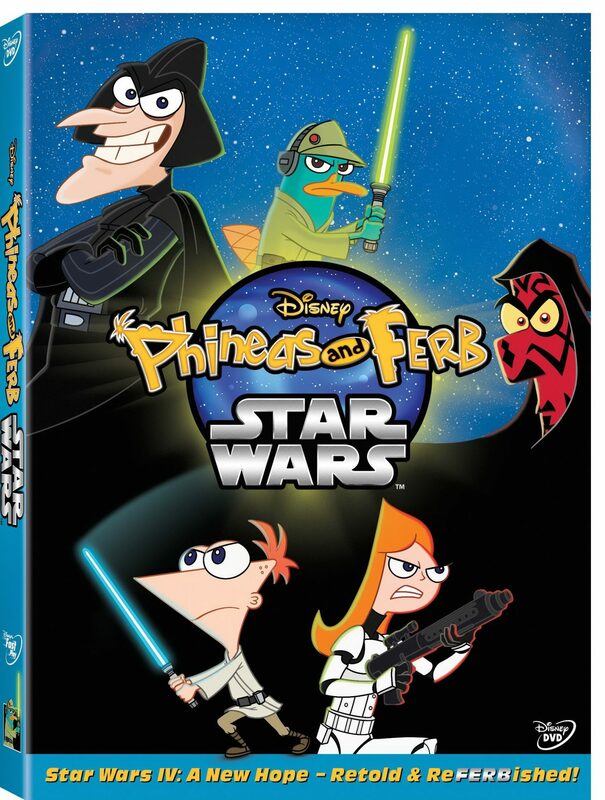 The DVD cover says “Star Wars IV: A New Hope – Retold and ReFERBished” and Darthenshmirtz mentions a sequel. This time around, instead of reinventing the whole first film, they went through and ran parallel to it while interjecting their own bits here and there. They threw in some allusions to later films and to the prequels, too, which is kind of cool but I hope it doesn’t mean we won’t get to see the Empire Strikes Back and Return of the Jedi reimagined some where down the line! There are no real special features on this DVD release. What is included on the disk are five other episodes of the series. Each one is worth watching. I mean, the whole series is worth watching! But they aren’t related to the Star Wars special. Probably my faorite one is “Steampunx” which features a scene with Professor Elemental rapping about steampunk. If you aren’t familiar with Professor Elemental you should be. Check out the website. Because it’s awesome. Another cool thing that comes along with this DVD set? You get a Perry the Platypus keychain where he’s trapped in carbonite! How awesome is that? Definitely a super cute Disney Channel release, Phineas and Ferb: Star Wars is more than worth a watch. Star Wars fans familiar with the Phineas and Ferb series should get a kick out of the one-hour special and kids who love both series are going to love this as well. A REVIEW COPY OF PHINEAS AND FERB: STAR WARS ON DVD WAS PROVIDED FOR THE PURPOSE OF THIS REVIEW BY ALLIED INTEGRATED MEDIA AND DISNEY. NERDOPHILES WAS NOT COMPENSATED FOR THE REVIEW AND THE OPINIONS HERE ARE OURS AND OURS ALONE.